For the chocolate almond spread, pour the almonds into a bowl and cover them with the water. Let the almonds soak for at least an hour, preferably overnight. Drain the bowl of soaked almonds, reserving five Tbsp. of the soaking liquid. Add the almonds, reserved liquid, and remaining spread ingredients into a food processor. Puree until the mixture has a fine, spreadable texture. Remove the mixture from food processor and set aside. Assemble the bruschetta by spreading two tablespoons of chocolate almond spread on the toast and arranging one sliced strawberry on top. 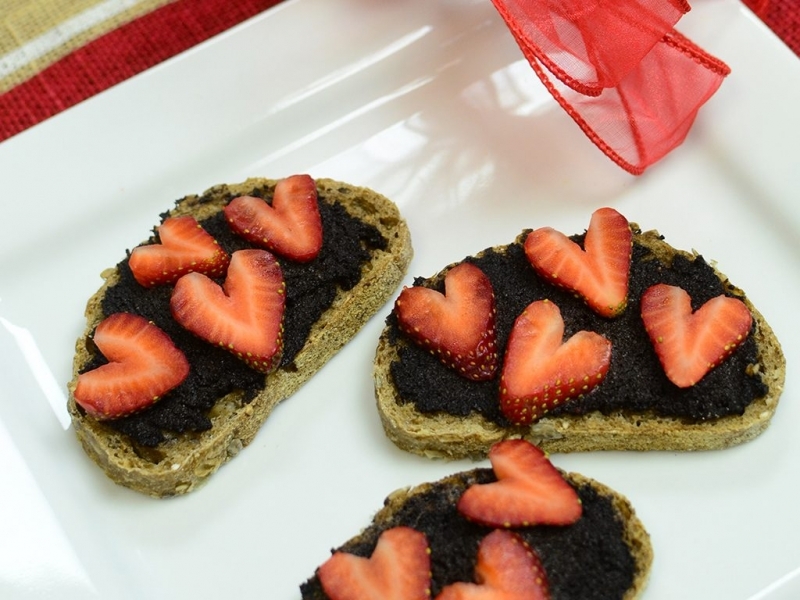 Celebrate American Heart Month and Valentine’s Day with this healthy, well-balanced, and delicious treat! This snack contains three of the five food groups and is a great source of dietary fiber, protein and heart-healthy fats.